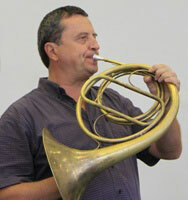 Zdeněk Divoký studied French horn at the Brno Conservatoire and the Janáček Academy of Music and Performing Arts under professor František Šolc. He is a laureate winner of competitions in Munich, Markneukirchen and Prague. In 1973 he joined the Brno State Philharmonic Orchestra, and since 1979, he has been a member of the Czech Philharmonic Orchestra, combining his position in the CPO with teaching post at the Prague Conservatory and at the Music Faculty of the Academy of Performing Arts in Prague. He is presently a member of the Prague Horn Trio and the Czech Wind Harmony. During his career, he recorded for Supraphon, Hänssler, Pony Canyon, Naxos; among others, he recorded a solo CD “Horn concertos by Antonio Rosetti” (with the Czech Chamber Orchestra). He specializes in natural horn playing; in 2007, he gained a Ph.D. degree, his thesis dealing with the history of natural hor playing in Central Europe.